Gabriel plays on his album trumpet, flute, flugelhorn, Valve 'bone. Featured artists are Miles Black, Greg Manning, Lew Laing, Bob Baldwin, Jeff Lorber (keys and key bass), Warren Hill, Rock Hendricks, Walle Larson (sax), Ronny Jordan, Paul Brown, Rob Tardik, Adam Rohrlick (guitar), Dee and Brittani Cole (vocals). King James was originally released on Gabriel's album Kissed By The Sun (2012). The song shines with a perfect horn arrangement that features Gabriel Rock Hendricks on the saxophone. The funky rhythm guitar creeps into your soul and even some vintage organ makes the funk authentic. Way After 8 gives us a reunion with the all-too-prematurely deceased guitarist Ronny Jordan. The tune was originally recorded as After 8 on the same named album by Ronny (2004). Gabriel seamlessly integrates his outstanding trumpet into the original song. It's Real is the second tune taken from the album Kissed By The Sun. Toronto native Rob Tardik is since two decades an in-demand guitarist of the Canadian music scene and is featured on this song. Of course, the title song of the aforementioned album should not be missing. Hasselbach and keyboardist Jeff Lorber are the dream team be it as performers or composers of this album. Hasselbach also chooses Kindness from this outstanding album on which Jeff Lorber lets the keyboards groove in an unbelievable manner. The Rhodes is without any doubt his trade mark. Gabriel's 2010 release Told You So won ‘Album of the Year’ and ‘Instrumentalist of the Year’ at the 2011 Canadian Smooth Jazz Awards. We listen from this album Shake It Down with Rock Hendricks on sax which is completely under the sign of the funk. Lovelight from the album Open Invitation (2014) is the only vocal tune featuring singers Dee and Brittani Cole romancing the candlelight atmosphere. Mulberry Street from the album Cool Down (2008) perfects the interplay between Gabriel and Jeff Lorber to a new contemporary jazz summit. Quickly follows the blazing title song of the above-mentioned album on which Rock Hendricks joins the both on sax. Equate Her is taken from Told You So. The bouncing song features Paul Brown on guitar. Gabriel skillfully varies between trumpet and flute. East Coast from Cool Down presents saxophonist Warren Hill, who makes himself scarce with his own new releases. By the way the horn arrangement is exquisite as always. Peace Song has made it on three albums after all: Told You So, Sweet And Saxy (2018) and on this album. The steel drums deliver a nice Caribbean flair and Paul Brown serves his blissful guitar chords again. Count Me In, the first track from Open Invitation shows multi-instrumentalist Adam Rohrlick who shares with Gabriel the passion for Vancouver. Rockin' the Ribjoint, to find on the album Told You So, is a further worthy collaboration between Hasselback (muted trumpet, flute) and Jeff Lorber (keys, Hammond B3 organ) celebrating the funk. Keyboardist Greg Manning is the featured musician on Propulsion with a winking quote of Papa Was A Rolling Stone. Gabriel played trumpet on Bob Baldwin's album Twenty (Chameleon 3000). Bob returns the favor Charmed Life. Bob shows his mastery of the piano, Gabriel pulls on the same level. The funk infused Lock It Up showcases saxophonist Walle Larson, while Hasselbach plays the first role on trumpet. Ready When You Are spreads a more melancholic atmosphere featuring Hasselbach on flute, muted trumpet and trumpet. Starpixie (Kissed By The Sun) is the last tune of this excellent collection featuring anew Jeff Lorber on keys and synth bass, a deadly combination. 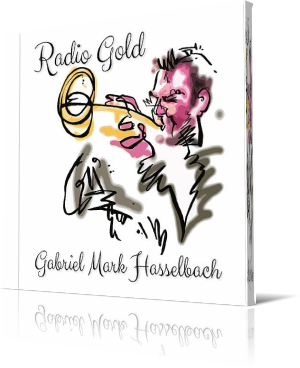 However the real star is Gabriel Mark Hasselbach shining on flute and trumpet again. Listening to Radio Gold is pure pleasure, but for the radio programmer rather a torture, because he receives such an almost inexhaustible selection of highly qualified songs. Never before has the title of an album been so appropriate as in this case.